We do NOT encourage to use this script since WaveVR_PoseTrackerManager is a better choice. WaveVR_ControllerManager tracks device(s) and shows / hides corresponding GameObject(s) if device(s) is tracked / lost-tracking. Once a tracked device(s) is connected to a host, WaveVR_ControllerManager will broadcast the device index. When WaveVR_ControllerManager receives event device_connected which is broadcasted from WaveVR.cs, it will check the device connection status in OnDeviceConnected. Function BroadcastToObjects sends broadcast to SetDeviceIndex function in customized script of a specified GameObject. 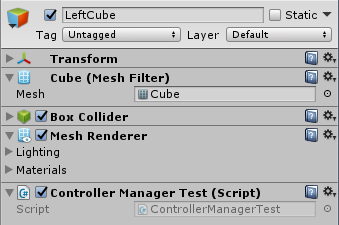 Look in Inspector of CubeManager. 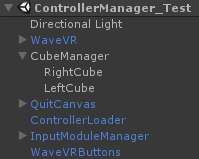 The script WaveVR_Controller Manager is used here. We put RightCube to Dominant, LefCube to NonDominant. 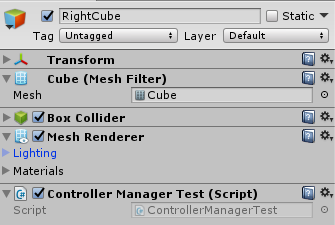 RightCube and LeftCube are used to demonstrate the usage of sample script ControllerManagerTest.cs. The sample script ControllerManagerTest.cs is used to receive the index from WaveVR_ControllerManager. Run this sample in Android device, if right / left controller is connected, right / left controller will be shown in scene. If device connected, OnDeviceConnected is called. The sample code ControllerManagerTest.cs shows how to get pose of device by using the device broadcasted from WaveVR_ControllerManager. The function SetDeviceIndex is unique and used to receive broadcasts. After receiving a broadcast, the eDevice is updated. In Update, we call Interop.WVR_GetPoseState with _type to get the pose we want.